About us | Tea with a Twist! What are those black things at the bottom? Those are Tapioca Balls! They can also be called Boba, Bubbles, or Pearls. They are made from tapioca starch and have almost no taste, but are slightly sweetened to add to the flavor of your tea. Their consistency is soft and chewy and reminds us of gummy bears. Unlike many other beverages, this drink is a recent invention, first created in the 1980′s in Taiwan. As always, there are a variety of people who claim to have first invented this drink phenomenon, but it soon spread from Taiwan to other Asian countries. 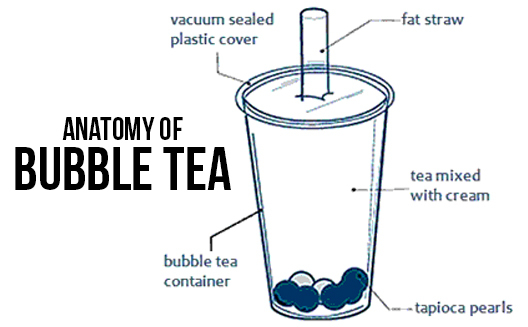 No, bubble tea is not carbonated. In fact, it gets its name from little foamy “bubbles” that form at the top of the drink while being shaken or blended. This is why you can still order a “Bubble Tea” without the Tapioca Balls. When ordering your Bubble Tea, you can make it as unique as you are, adding or substituting almost anything you can think of! Many people try bubble tea only once are addicted from the very first sip. Others suggest it holds more of an acquired taste. Either way, we have many different options to choose from so whether it is your first time exploring the world of bubble tea or if you have it on a regular basis, come on in and let us walk you through our wonderful world of tea… Bubbles optional!